I know, I know. 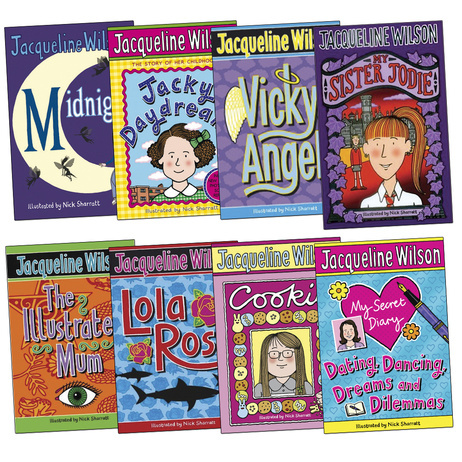 You made your mum rush out first thing this morning to buy you the latest Jacqueline Wilson book, didn't you? Its crisp, inviting, DELICIOUS-NEW-BOOK-SMELL pages are waiting for you on your bedside cabinet, and you've been anticipating kicking off your pink, flashing trainers, shutting yourself away, and curling up with it all day long. But it's me. YOU! You, from the future! How cool is that?! Let me steal you for just a couple of minutes. There are a few things I'd like you to know. Let's get this straight. You're never going to be an actress. As much as this fierce ambition of yours is great and admirable, you are still the same girl who is going to fall (aka fly spectacularly) off of the stage on the opening night of your year six school play. I don't necessarily wish to crush your tender dreams, but you are, to the acting world, what an uninvited guest is to a dinner party. Awkward. Thoroughly awkward. And I know you know it. Please just stick to the thing you love the most: your writing. You're alright at it you know. One day, you'll use it to make a difference. Ross. Let's talk about Ross. You seem to be enjoying chasing him around the playground and leaving him notes declaring your eternal adoration. We get it. You fancy him. You REALLY, REALLY fancy him and 'omg he is just sooooooooooooooo perfect and such a dreamboat KB 4 RB 4eva and eva and eva <3'. Fancying him is all very well, but please, just be a liiiittle quieter about it. Just slightly? I promise you that this dramatic, pre-pubescent, unrequited love affair isn't worth the mockery that you shall be subjected to over the next decade. Despite what anyone may tell you, you're not too old for Sylvanian families. This is no time for your 'house on the hill' to be gathering dust on top of your wardrobe. When you are 23, you will find yourself in a mournful daze as you wander past the Sylvanian families section of a toyshop, fingertips traipsing over green plastic shutters, wishing it was socially acceptable for you to sit on the floor and make Basil, the mousey Chef, clatter into his charming country cottage. Embrace those intricate plotlines of yours. Making woodland animals use mini toasters is the the pinnacle of all joy. You don't have to eat pizza and chips for dinner every night. Give vegetables a go some time: I dare you. You have a hungry brain. Keep feeding it with knowledge and experiences. Learn as much as you can about everything that you can. Books are tonic for the idle mind and will always be more reliable than human beings; immerse yourself in them. Appreciate creativity and literature and music and science and technology and religion and history and sports and people and places. Appreciate everything, even the lessons on 'breeds of gulls', which may well be told to you by a half-intoxicated, bearded man on a train one day. If you never speak of it again, at least you will know which birdie is most likely to steal your tuna sandwich. Guess what?! Here's the biggy. Those daydreams you have whilst engrossed in Gareth Gates interviews in 'It's Hot! and Girl Talk' will actually happen some day. You're going to meet him! Yup, you heard. You're going to meet Gareth Gates! You'll wait 11 years for your moment, but, without giving too much away, you'll get to watch him prance around in leather tassled pants, and he'll give you a cuddle afterwards. Fortunately for him, you're not going to hold quite the same degree as lust for him as you do right now, but it will be a little victory all the same. Your tiny, chubby hands are not going to grow any more. That's right: it doesn't get any better than this, kiddo. Aged 23, you still have the hands of a 10 year old. They are quite useless, but they look a bit funny when you wave, and they'll make a lot of people smile when you're older. Don't fret about it. Make the most of being 10. You don't know much about the world yet, but it's a bit of a scary place. You are lucky enough to be wandering carelessly through life, wrapped up in a beautiful state of blistering naivety. Yes, I know you're a bit worried because your legs are sprouting coarse, dark hairs, and your 28AA bra feels a bit weird on your skin, and I know Miss Pont has recently told you that you could fill a bath with the menstrual blood you'll be losing which is TOTALLY-THE-GROSSEST-AND-MOST-TERRIFYING-THOUGHT-EVER, but in the grand scheme of things, this is a really precious and wonderful time for you. Trust me on that. Go on then...Back to your book. Thank goodness for Jacqueline, hey? I can't wait to champion my inner 10 year old this month and see Jacqueline Wilson's wonderful 'Hetty Feather' on stage in Brighton! Set in London in 1876, the story starts when Hetty is abandoned at London's Foundling Hospital, and follows her 'amusing and gripping' journey through foster life, her escape to the circus, romance, and the opportunity to find her real mother! You can join me on her spectacular adventure by picking up tickets here! And don't forget to tell me on Twitter what you'd say to your 10 year old self! Great post - loved reading this!